LeEco’s big one-day sale is on, and smartphones, television, and accessories are up for grabs on Flipkart and LeMall.com with major offers. 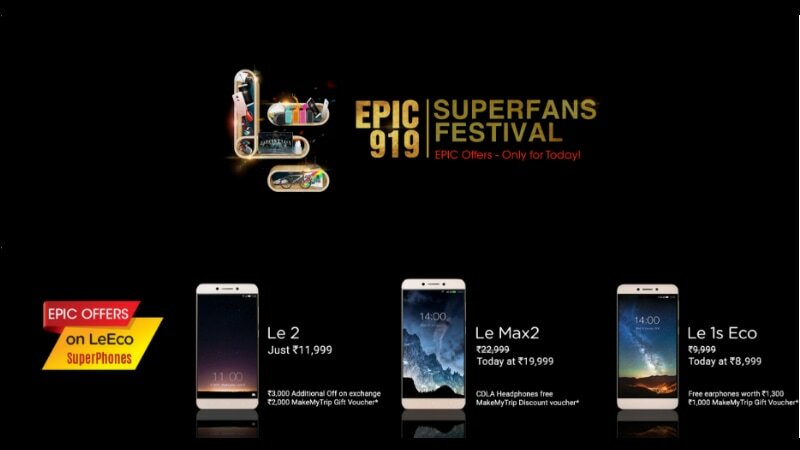 The sale is active only for 24 hours, and this Epic 919 SuperFans festival has been introduced for the first time in India. This one-day festival was a huge hit in China, and the company is expecting it to be received in the same manner in India. It is expecting as much as Rs. 100 crore sales during this 24-hours festival in India. The sale ends at midnight, and smartphones available with offers are the LeEco Le 2, Le 1s Eco, and Le Max 2. The LeEco Le 2 is available in Rose Gold and Grey colour variants at the same launch price of Rs. 11,999. However, there is an upto Rs. 10,000 exchange offer discount, and a free gift card worth Rs.2,000 from MakeMyTrip. There’s an extra 10 percent off to credit/debit card holders of major banks (up to Rs. 2,000) as well. The LeEco Le 1s Eco is being sold at a 10 percent discount, and is priced at Rs. 8,998. Users can further get u pto Rs. 8,000 discount on the exchange offer, and LeEco will bundle free earphones worth Rs. 1,300 with the device. The MakeMyTrip and bank cashback offers are applicable with this smartphone purchase as well. Lastly, the LeEco Le Max 2 Rose Gold 32GB variant is being sold at Rs. 19,998. Apart from the 13 percent discount, you can further get upto Rs. 15,000 off on exchange of old smartphone. LeEco is giving the MakeMyTrip gift card and the bank cashback here as well, and additionally is also bundling CDLA earphones worth Rs.1,990 for free. Televisions on offer include the 65-inch Ultra HD Smart LED TV for Rs. 99,790. Users can avail up to Rs. 25,000 off on exchange offer. The Smart TV is powered by a Cortex A17 quad-core processor paired with 3GB RAM. It offers 16GB of internal storage and runs on Android 5.0 Lollipop. LeEco offers 2 years of comprehensive warranty and 2years of panel warranty on the TV set. There’s also a 3D variant for Rs. 1,49,790 with the same listed offers. The 55-inch variant is up for grabs for Rs. 59,790, and an exchange discount up to Rs. 25,000 can be availed on the product as well. All the products are a part of the F Assured scheme, which means that they will be delivered in 2 to 4 days without any delivery charges. On the LeMall.com website, the company is selling earphones, headphones, smartphone cases and covers, Bluetooth speakers and ring bracelets at a discount. Notably, the Leme Bluetooth Headphones are available at a Rs. 500 discount, and are temporarily priced at Rs. 1,999.